It's a cute cute summer...the mini series - Stop staring and start sewing! At least it will be a cute cute summer if I keep making these skirts. Joey and I were lucky enough to be invited to a fun wine tasting party with some friends (and strangers who might just become new friends) and I decided it was an event worthy of a new skirt. So I put this one together in about 2 hours (with the lining!). Last year I converted a simple a-line skirt pattern into a super simple a-line skirt pattern by removing the seam in the back and putting the zipper on the side so it's now just a 2 piece pattern instead of 3 pieces. It's my go-to pattern and can be embellished so many ways. This one got a ruffle (with a serged rolled hem so it couldn't have been easier). Here's the whole skirt (time to dust the mirror again!) and I'm so in love with it. 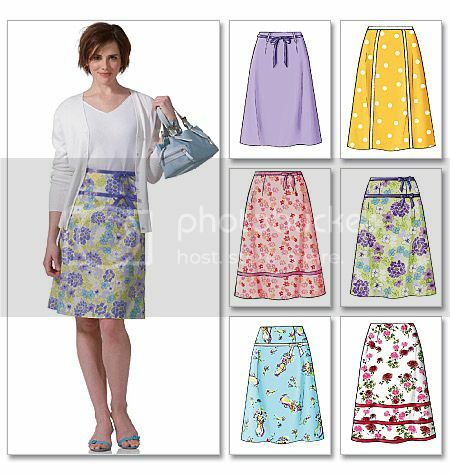 I chose this gorgeous and uncomplicated print from Jennifer Paganelli's So St Croix collection and I think it makes a fun but classic skirt. So I'm going to start a "mini-series" for the month of June to show you how to convert an a-line skirt pattern into 2 easy pieces and then you'll be set for the summer too. Once you have your pattern ready we'll start playing with different variations. I'm using this pattern (Butterick 4461) so if you want to join along you can keep your eyes peeled for a pattern sale at Joann's. If you can't find this one just find a basic a-line skirt pattern with darts in the front and back and we'll make it work. This will be lots of fun and this style of skirt looks great on every type of figure so don't be shy (because I want everyone to share their pictures in my flickr group)! And yesterday's Friday Freeday has been delayed until today. The winner of last weeks goodies is Anita who left a comment at 8:05 on 5/15. Yay Anita!! Here's this weeks bag 'o fun! Yes! It's a bag with over 2 yards of scraps from your favorite designers in mostly pinks and greens (and a few cute brown colors). Just say hi (or pour out your soul, whatever) and have a wonderful weekend! Oh, and all Moda fabrics are marked down 25% (yes!) through June 5th! 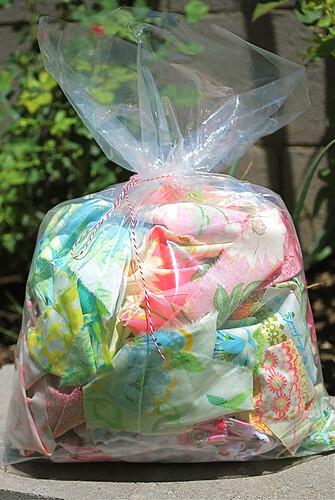 Don't wait too long or your favorites will be snapped up by some fabric crazy stash building type of person!